Samsung Galaxy Note is the only device in its class, a hybrid of smartphone and tablet running Android. Samsung released it only two months ago and already reached the dream number of 1 million. I called it dream number because of two facts. Galaxy Note is not available everywhere yet and it is a pricy gadget, not everyone can afford it. In fact it is not released in US so far. The number of units shipped is always more substantial than the number devices out there in end-users' hands, but it always reflects the people’s demand for the gadget. Read the press release by Samsung to know more about the successful journey by Samsung so far. Samsung's flagship smart device Galaxy Note has reached 1 million global shipping. 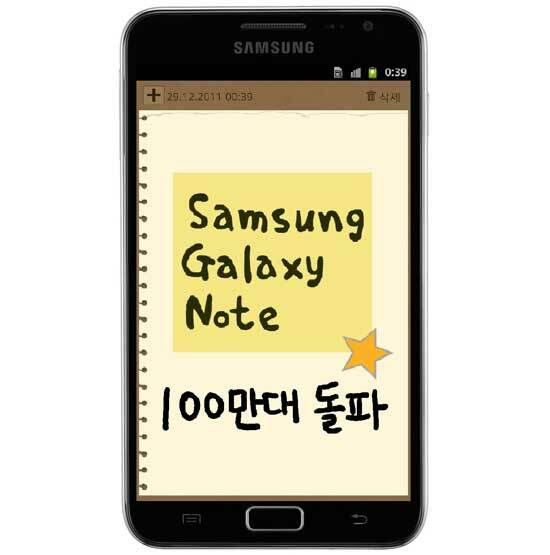 Samsung Electronics said on the 29th that it has shipped more than 1 million units of Galaxy Note globally. The worldwide sales of Galaxy Note are also on the rise in Europe and Asia including France, Germany, Hongkong and Taiwan. The rapid global sales of Galaxy Note are notable since it is creating a new market for something between smartphone and tablet pc. The speed of the global sales is expected to accelerate further next year when it will be available in the US. Recently, Financial Times reviewed highly of Galaxy Note, commenting it as"a happy medium for consumers who want to carry just one device, rather than both a smartphone and a tablet and whatever other portable gadget they pick up on their way out". A Samsung official also said "1 million global shipping of Galaxy Note means it has well positioned itself as a market creator," also adding "Samsung will continuously strengthen its leadership in the global smartphone market as well as create new markets with innovative devices."